© Artists Rights Society (ARS), New York/ADAGP, Paris. 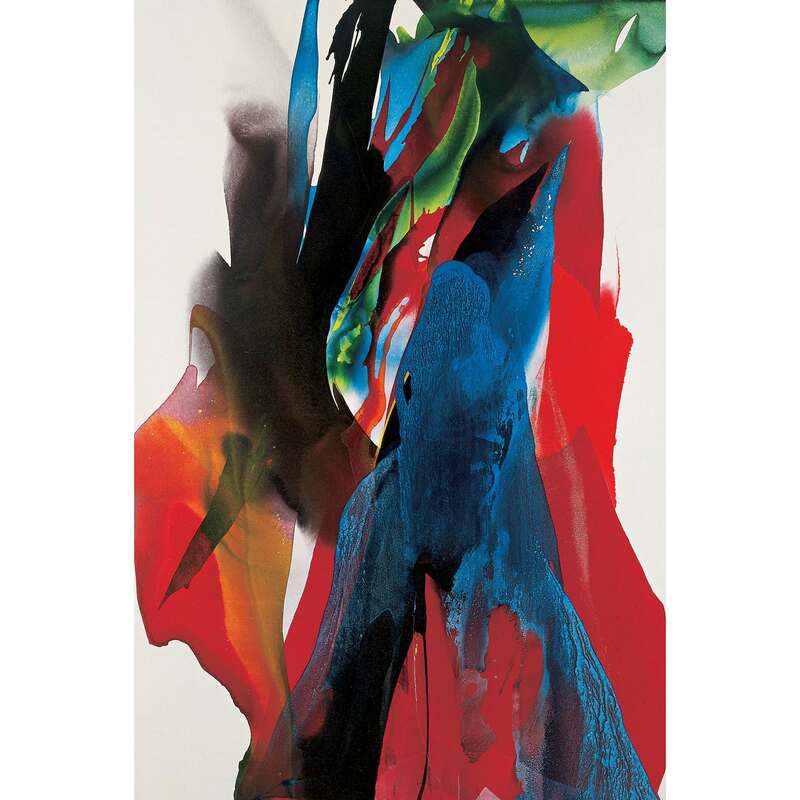 Overlapping wings of color stretch upwards in Paul Jenkins’s Phenomena Veil Over & Under. As the title suggests, the transparent flowing veils overlap and interact. They invite readings as both abstract forms and as evocations of parts of the physical world. Jung, Goethe, Paul Klee, Zen Buddhism, the occult, astrology, alchemy, and the art of Moreau, Redon, Clyfford Still, Rothko, Sam Francis, and artists whose work was called art autre by Michel Tapié (Wols, Michaud, Fautrier, Dubuffet, Mathieu, Hartung, Pollock, and Tobey). By the 1960s, Jenkins had perfected his method of working. He primes his canvases with a white acrylic undercoat, which both protects the fabric and creates a crucial luminosity that shines through the overlays of thin color shapes. The artist mixes his own intense hues, combining a non-drying, highly viscous acrylic paint manufactured in Germany with an acrylic matte medium .This mixture he thins with water. He pours his paint onto a tilted canvas (unstretched if large), moving it out from puddled areas with a long-handled brush or a dull single-edged ivory knife, taking care that no “mark” of the artist’s hand is seen. As he works, Jenkins pauses often to consider the evolving work from all sides, and to view it from the top of a ladder, where he can see the whole without reflections from still-wet surfaces. He “corrects” areas by wiping them free with water and clean cloths. If the color is too dense, he lays down a new granular white veil, which can shine through additional transparent layers of color. The finished work is sprayed with a special matte varnish that preserves the luminosity with no shiny surface. All of this is done “in the moment,” which the artist describes by saying that he feels like a medium responding to deep inner guidance. Inevitably, Jenkins’s veil paintings draw comparisons with works by Helen Frankenthaler and Morris Louis. However, Louis and Frankenthaler worked on raw canvas, while Jenkins primes his canvases. Moreover, the compositions of each artist are distinctive. Phenomena Veil Over & Under, at five feet in height, is human scale, and more intimate than many of Jenkins’s 1960s works, but shares with them the poetically allusive words that follow the initiating “Phenomena.” In Phenomena Veil Over & Under, the vivid blue, orange, red, green, lavender, and brown shapes move up the canvas with the leisurely pace of clouds, and are equally allusive. One may think of tidal movement, of soaring avian wings, of swirling foliage, of curling smoke trails, even (in the central blue form) of a veiled figure that recalls early drawings that Jenkins made based on Barbara Morgan’s photographs of Martha Graham dancing. The shifting allusions of this evocative composition touch our inmost core.